Repsol Honda rider Casey Stoner became the fastest in the qualifying session which took place at Le Mans Circuit, Saturday, May 14, 2011. Might re-proven Honda engine in the French MotoGP qualifying session. The Australian rider had won pole position three in the 2011 season. Stoner led the big four starting positions occupied by the drivers with Honda RC212V in France. Gresini Honda satellite team rider, Marco Simoncelli, clinging tightly in the second position. Stoner recorded a time of 1 minute 33.153 seconds, while Simoncelli left only 0.059 seconds slower. Bede notes that thin time the signal will be tight races today. 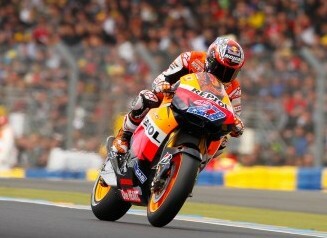 Moreover, Stoner save ambitions first victory at Le Mans. Another aim is to raise the position in the standings is now only ranked third. He still lags behind Yamaha team mate Jorge Lorenzo and Dani Pedrosa. Stoner, Lorenzo and Pedrosa has won one race each season. However, points behind Stoner far enough away from Lorenzo at the top and Pedrosa. New Stoner pack 41 points, while Pedrosa Lorenzo 65 points and 61 points. Stoner took victory in the inaugural race in Qatar. Furthermore, the problem during the race. In the next race which took place in Jerez, Spain, he had the misfortune when in-sliding Valentino Rossi failed to finish. While in Estoril, Portugal, Stoner having problems in the clutch.